A local musician is turning her experience of cancer into something more positive by raising money for Macmillan Cancer Support. Vicky Stock, who was recently diagnosed with secondary breast cancer at the age of 32, is a longstanding member of Blackwell Concert Band and has organised a special charity concert in Barnt Green with the aim of raising more than £1,000 for the cause. 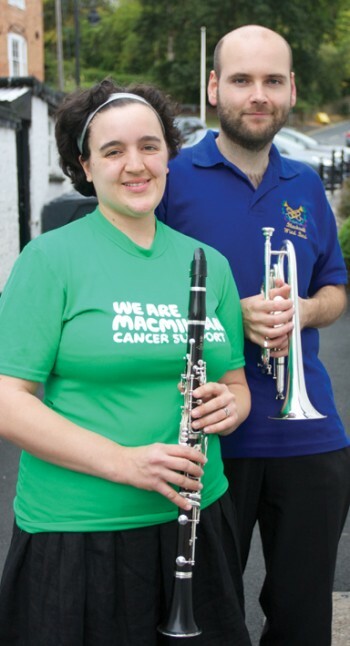 Clarinet player and band secretary Vicky, who is currently undergoing targeted drugs treatment and is due to have surgery soon, is very keen to give something back to Macmillan in recognition of the support she receives from the charity. “The band has pledged this year to raise as much money for Macmillan as possible, as the charity has been such a great source of support for me,” she explains. The concert takes place on Saturday October 29 at St. Andrew’s Church, Barnt Green. Starting at 7.30pm, it will feature not only Blackwell Concert Band, but also local groups The Bel Canto Singers and Fairfield Folk. “We’ll all be performing our own ‘sets’, but all three groups will come together for a special number at the end, probably involving some audience participation!” says Vicky. The Concert Band, in which Vicky’s husband Tim plays the cornet, typically plays lively, well-known pieces such as film scores, pop tunes and songs from the musicals. Tickets cost £5 (£3 for children), and light refreshments will be available. The fundraising is part of Macmillan’s “100s and 1000s” campaign, which marks its centenary year. Blackwell Concert Band has already performed at the 2011 Bromsgrove Carnival in aid of the charity, and will hoping to boost the coffers still further at Severn Valley Railway’s Santa Special event in December. Vicky has also volunteered for some of Macmillan’s other fundraising activities, and says this has helped her the most, as it offers something else to focus on. “Having cancer is obviously a negative experience, but we can turn it into something more positive by giving something back,” she says.